Youth Department – Amethyst Hall (Introduction to Youth Ministry by Pr. Jobbie Yabut – Youth Director, Southern Asia Pacific Division. Morning Worship Speaker – Pleny R. Camagay – Retired Children’s Ministries Director of SPUC. Morning Lectures – Pastor Jonathan Kuntaraf – the Sabbath School Director of the General Conference together with his wife discuss the importance of Jesus’ method of evangelism. Elder Ted Wilson together with his wife, Madam Nancy Wilson arrived at Mountain View College to deliver a message of inspiration from God to more than 8,000 delegates from the area of Southern Asia Pacific Division. The parade was participated by different missions and conferences that belongs to the Southern Asia Pacific Division. Hon. Camilo Eduave Pepito – City Councilor of Valencia City, deliver the welcome address on behalf of the City Mayor of Valencia. The Opening Night’s message was delivered by Elder Ted Wilson encouraging the believers to a true revival. The night ended with a beautiful display of fireworks. To view pictures visit and like the Northeastern Mindanao Mission Facebook at https://www.facebook.com/nemmadventist. 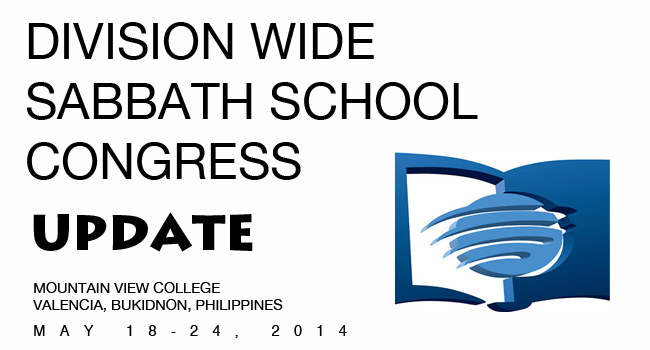 Visit us often for more updates about the congress.